Today there are motorized lifting systems available for some window covering products. These systems use a remote control and can be battery operated or hard wired. Motorized shadings, shades and blinds are designed for ease of operation and precise control. With remote-control units, operating functions are served by a hand-held remote transmitter and a remote receiver mounted near the covering. A single remote transmitter can operate up to 12 treatments. With switch-control motorized units, a three-position switch is used to operate each window treatment. The lower travel limits of motorized window treatments are pre-set at the factory. Buttons on the motor assembly provide for adjustment of the lower travel limit after installation, if necessary. 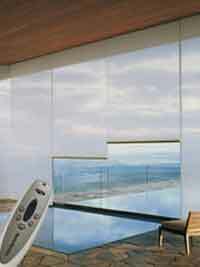 Upper travel limits of motorized window treatments are controlled by a stall sensor unit. The sensor prevents the motor from continuing to run after the treatment is fully raised. There is one stall sensor unit for each treatment. It is located next to the control unit (remote control) or on the back of the switch plate (switch control).